Long time no blog (again), so here's a top 10 list of anime that will put a smile on your face! This list is in no particular order so please enjoy- let me know your "happy" anime choices in the comments below. On a side note I haven't been posting much since I've been busy with work, getting ready for school and other redundant life-preoccupations. Oh, and I was at Otakuthon in past week or so- if you were there tell me how your experience was since it was my first anime-con! Alright who doesn't know Magi? It's an extremely popular franchise, and if I remember correctly the manga is on it's last arc? Very fun anime to watch with very uplifting and upbeat characters with funny dynamics like Alibaba and Aladdin. 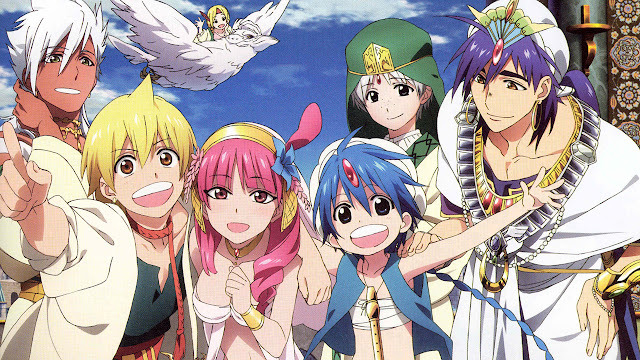 The anime has a great storyline, though serious at times, Magi still finds a way to make the anime fun to watch. Sixty episodes of pure comedy gold. Kaiser de Emperana Beelzebub IV also known as baby-Beel becomes fixated to Oga Tatsumi and his vigorous strength amongst the masses of people in a no good high school filled with evil-doers. 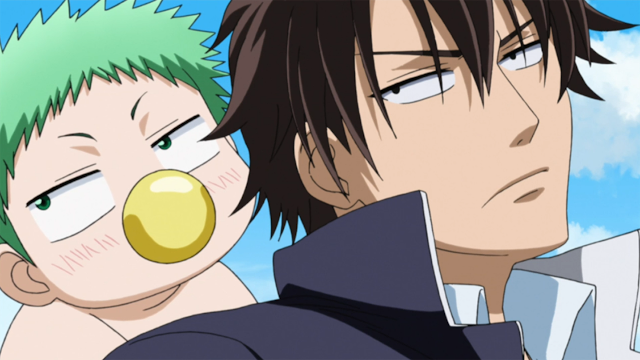 I think I've lost count when it comes to the number of times I've laughed at Oga's facial expressions and baby-Beel's shenanigans. It's a whole lot in the anime hard to condense into a few sentences; if anything it's filled with good laughs that will uplift your spirits. Don't watch this anime if you're looking for a good story, the plot kind of goes everywhere leading you with an ending that will leave you unsatisfied. 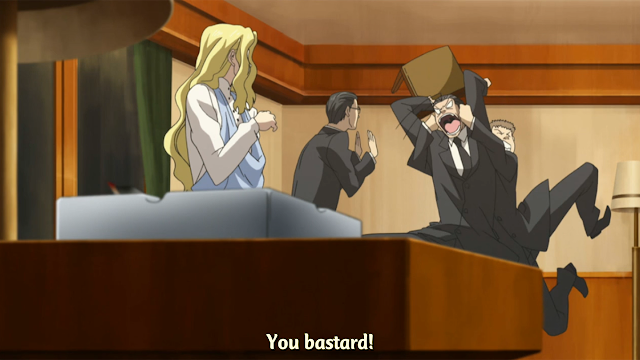 Aside from all that Beelzebub is an awesome comedy. On the outside looking in Level E might turn people away from watching the anime; but hey, don't judge a book by it's cover. Aliens residing on earth have woven themselves into the fabric of the planet and one of those aliens, Prince Baka, finds himself wreaking fun havoc amongst Earth habitants which drives people from his home planet insane. I wasn't expecting to enjoy Level E as much as I anticipated because the aesthetics of the anime did't look that great, but surely I was proven wrong since the content was filled with great one liners and funny episodic shorts. Boku no Hero Academia doesn't fall into the "comedy" genre- which typically is the genre where people tend to find entertainment to lift their spirits up. 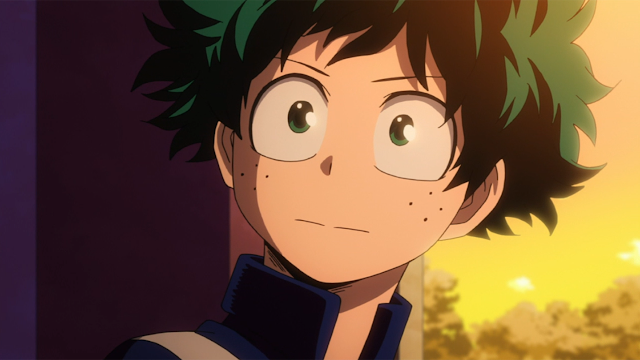 It's a feel-good anime in a sense where you see a character with no potential, Izuku Midoriya, given the ability to have his dreams come true. It's a happy anime where you get to see Midoriya accomplish goals he would have never accomplished if it weren't for the kindness of others. The World God Only Knows has spanned what? Three seasons and a couple of specials? And there's a good reason for that. 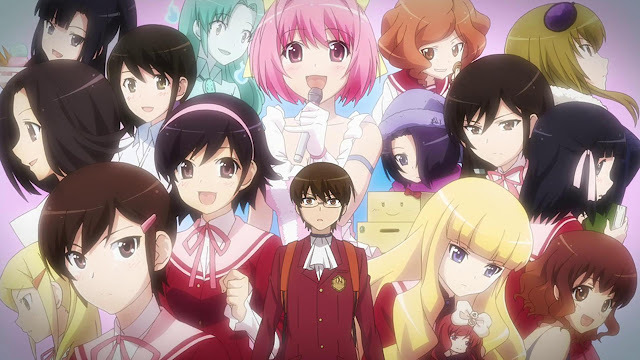 The anime is about a neet/ dating sims pro, Keima Katsuragi, getting dragged by shimigami Elsie to capture evil spirits through the most funniest way possible. The formula Katsuragi' follows to capture theses spirits, who reside in females, is to first make them fall in love with him and in doing so lock lips to release these evil spirits. It's the juxtaposition of a dating sims fanatic actually performing these "dating sims tasks" in real life that makes the anime fun to watch. I could go on and on about this franchise and how much I enjoy it but go ahead an give this anime a shot for yourself. 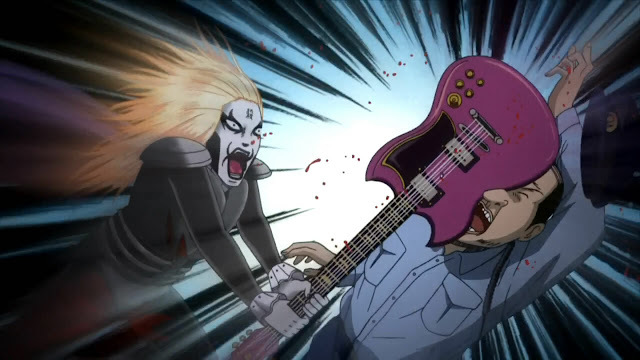 If you're into vulgar comedy, Detroit Metal City is the anime for you. Basically an anime about rockstars and their laugh out loud antics going against the law and what not. Episodes aren't too long if I recall, so you can get in some very, very good laughs if you have nothing to do in your free time. Stay away from this anime if you get easily offended...lol. Sagara Sousuke. That's all I need to say. Full Metal Panic is a mecha filled anime focusing on a group named Mithril and their goals to wipe out terrorism on the planet. Although the anime sounds like an action packed story, there are a good handful of moments that will put a smile on your face. Sagara Sousuke, a teenaged Mithril member who seems to have work on his mind 24/7 is assigned to protect high schooler Kaname Chidori. 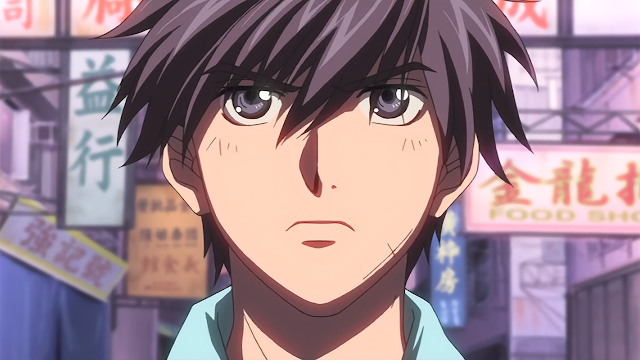 Sagara attempts to assimilate himself to society while protecting Kaname and going around the world fighting terrorism. The funny moments in the anime comes from Sagara attempting to weave himself into society while his militant mindset places himself in weird/ funny situations; hard to explain but it's funnier if you choose to watch the anime. So I recently watched this not too long ago and I have to say that Skip Beat is the funniest shoujo I've seen in a long time. Legit had some laugh-out-loud moments while watching the anime. It's an anime about Kyouko aiming for the stars/ celebrity to plot revenge on an ex-lover; very hilarious anime with a bountiful amount of backstabbing, rivalry and good laughs. Who doesn't love a good anime about revenge from an ex-lover with some good ole backstabbing? It's these aspects I look for when I search for a good shoujo to watch...lol. On a side note: Kyouko is the spirit anime everyone should strive to be. If you've seen Usagi Drop, than you know why this anime will make you happy. Daikichi Kawachi a thirty year old takes in Rin Kaga who happens to be the child of Daikichi's grandfather born out of wedlock. 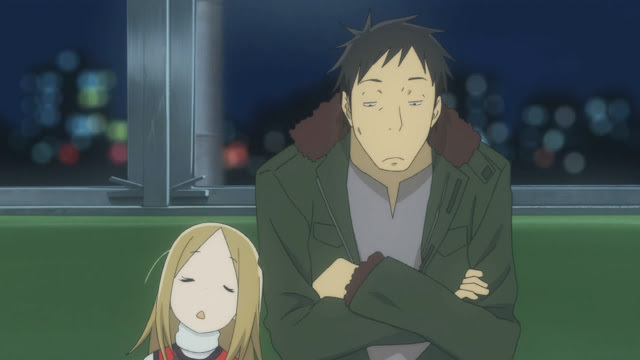 Really not much left to say about Usagi Drop other than it's an adorable anime about a man trying to navigate the waters of parenthood. Alright and my number one, I know I originally said in no particular order, anime that will make you happy is Aria the Animation. If you don't know what the anime entails search my blog on the reviews I've done on the third season and the specials. 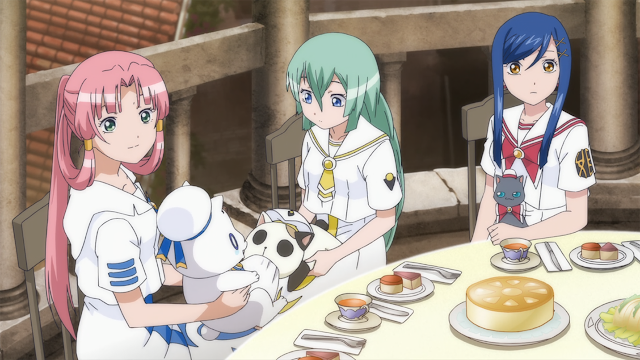 Aria is a very soothing and relaxing anime, the perfect anime to sit back and watch to relax. Being relaxed equals being happy at this point in my life with all the hectic road bumps in life. That's the end of this post. Thanks for taking a look at this list- tried my best to quickly scrap something together. I know a post on my blog is LONG overdue. Busy with a lot of things these days. Hopefully I can free up my time so I can blog some more because I enjoy doing this. Anyways I hope you guys find this post helpful! Tell me which anime make you happy in the comments below! i´m just agree with Usagi Drop and Detroit Metal City, Beelzebub is a hundred times more Hilarious in the comic and Boku no Hero's series barely shows something in his 12 episodes. I didn't saw the other series, but maybe i will it . You Know what will make you happy? Gintama, that shows rock. Thank you for your kind words :) Never read the Beelzebub manga, but I found the anime funny. I really enjoyed watching Midoriya for some reason. Yes try to other anime I've listed! I like this blog, good.